UPDATE below: Turkish government says Khashoggi killed. JAMAL KHASHOGGI, a journalist who has turned a trenchant and questioning eye on the leadership of his country, Saudi Arabia, entered the kingdom’s consulate in Istanbul on Tuesday to take care of what should have been routine paperwork. Saudi Arabia says he then left. His fiancee, waiting for him, says he did not, and he cannot be found. Turkey says it has seen no sign that he left the building. Mr. Khashoggi, a contributor to The Post’s Global Opinions section, appears to have disappeared, and we are worried. He continued writing columns for The Post after that. He wrote in February that the crown prince’s restrictions on free speech had “sucked the oxygen from the once-limited but present public square. The Turkish Foreign Ministry summoned Saudi Arabia’s ambassador to discuss the whereabouts of veteran journalist Jamal Khashoggi, Turkey’s state media reported, after he disappeared while visiting the Saudi Consulate in Istanbul on Tuesday. Ambassador Walid bin Abdul Karim El Khereiji was called to the ministry Wednesday for questions about Khashoggi’s location, the private broadcaster NTV reported from Ankara, the Turkish capital. The ambassador, who met with Turkey’s deputy foreign minister, denied having knowledge of Khashoggi’s whereabouts, Thursday’s news report said. 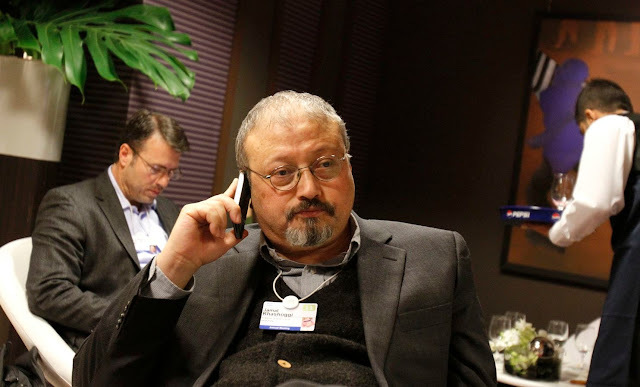 Turkey’s summoning of the ambassador came as the New York-based Human Rights Watch called on the Turkish authorities to intensify their investigation into Khashoggi’s whereabouts.